This is my latest review in the "I'm 36 going on 13" series, not to be confused with the "I'm 36 but have the mindset of a 16 yr old" series which is a wholly different topic. The former has had such greats as model rocket building, baseball card collecting, and RC car driving. The latter is more of a "scan the Shopko ads for anything in a bra" and "discuss at length the wonders of yoga pants" kind of mentality. Ah yes, I remember fondly my first bra ad, Lane Bryant if I remember right. It is probably still hidden under the bathroom sink back home. That broad tempting smile, that 12 clasp, 3-guage under wire in classic beige with the support hose to match. Makes me shiver just to think of it. A man has got to work with what he's got. But I digress. Back to the 13 year old desires. 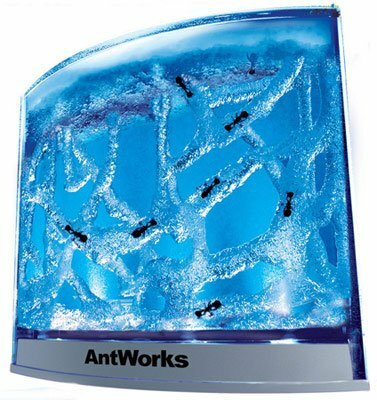 I always thought ant farms were cool but never had one as a kid. Recently, I was looking for one for my 7 year old kiddo when I found that technology has permeated every aspect of life, even bug farms. Ant farms have hit the 21st century people. I give you AntWorks Ant Habitat by Fascinations. If you remember the old ones, they were super thin, so you could see the tunnels, and filled with sand which, if bumped, made the tunnels collapse destroying the home of your innocent captives. NASA may not have gotten Morpheus of the ground without exploding, but they did score big with their new space gel for ants. The gel is water, food, and the home for the little buggers, and best of all, it is transparent so you can see the full 3D effects of their tunneling. It is thicker, sealed, and although you should open it once a week for some fresh air, it is completely self contained and requires nothing of you. So really it is the perfect toy and the perfect pet. Now for the ants. I went ahead and ordered some Harvester ants online because they are supposedly the best diggers. I ordered 2 tubes of 30 thinking they would likely die in transit from Utah, but being summer, 95% of them arrived alive and kicking. So, although the farm is supposed to handle about 30 ants or so, I dumped in the lot. There were too many, but they are ants, so who cares? I punched four holes in the gel to get them started as the directions recommended, but they ignored all of them and started digging from the sides. The way they work together is amazing and for 2 weeks all we talked about at the house was what progress the ants have made during the day. They really are amazing to watch. They work as a team and are constantly at it. They even pass pieces from one worker to the next forming a sort of assembly line to make the work go faster and more efficiently. (Union members should really be required to buy one of these and watch for a day before signing up.) They pretty much can dig all the way across the farm in a single day and at this point they have tunnels going everywhere. When one of them dies, they either consume it or move the carcass to the top of the farm so you can remove it, but all in all it has been great fun to watch and maintenance free. We did run into one hiccup. You can't put this in the sun or take it from inside to outside back to inside without condensation forming in the tunnels. This happened to us and it was turning into an underwater death trap, so we had to get inventive to clear out the water. What we did was this, we got a 1 gallon Ziploc bag, put the entire farm inside and opened the top. I then blew in the top of the ant farm (because I watched the Discovery Channel during "Ant Week" and knew how to get them moving). They sense the exhaled CO2 and all come running up to the top because they think a predator is attacking the hill. They all spilled out into the Ziploc (which sounds super creepy with them clawing at the plastic). I then withdrew the farm and put it in front of a fan to dry it out. After 2 hours it was dry and I poured the ants back in. Worked like a champ. The ants are supposed to last 1 - 3 months and are still going strong after a month and a half. My son loves the thing, my wife and daughter think it is intriguing, and I am reliving my youth. This thing is great, cheap, and educational, making it a 5-star on my list of toys/projects for kids. If only I had this when I was a teen, maybe it would have kept me out of the bathroom....then again, probably not.